Presentation given by Mervyn Taylor and Sarah Murphy at the 2011 End of Life Forum about Think Ahead. Mervyn Taylor. Sarah Murphy. 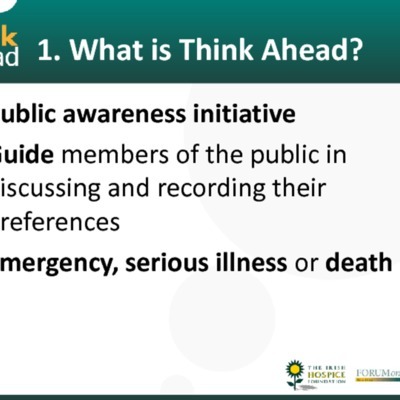 , “Presentation on "Think Ahead" at Forum 2011,” Archives Hospice Foundation, accessed April 21, 2019, http://archives.hospicefoundation.ie/document/1924.